Galaxy Note5: What is the UHQ (Ultra High Quality) audio feature? quality of sound closer to the original sound. 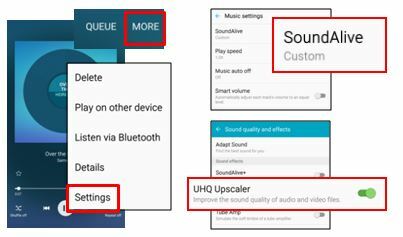 Tap "SoundAlive“ and turn on "UHQ Upscaler"
Note: To enable, the headset must be connected on the device. You can enhance quality of sound automatically and enjoy ultra high quality audio close to the original sound. UHQ Audio automatically estimates and recovers the loss produced during the playback of CD, MP3, streaming quality sound and converts it closer to the original sound. The file size does not increase compared to original file after the conversion . Galaxy Note 9: What makes the audio sound in high quality? Galaxy Note4: What are the features of the voice recorder and how to use it? Galaxy Note4: How to use the meeting mode on Voice Recorder?